Happy Last day of February everyone! Tomorrow starts a new month, and we only have two and a half more weeks until Spring! I don’t know about you, but I feel like Spring-time is a clean slate, sometimes more than the New Year, because the days are longer, all the bright colors are motivating, and everything is starting to grow, making a fresh start! Something that I usually do in spring is clean, everything from washing windows to wiping down all the baseboards in the house. I’m sure you’ve heard of “Spring cleaning” before! 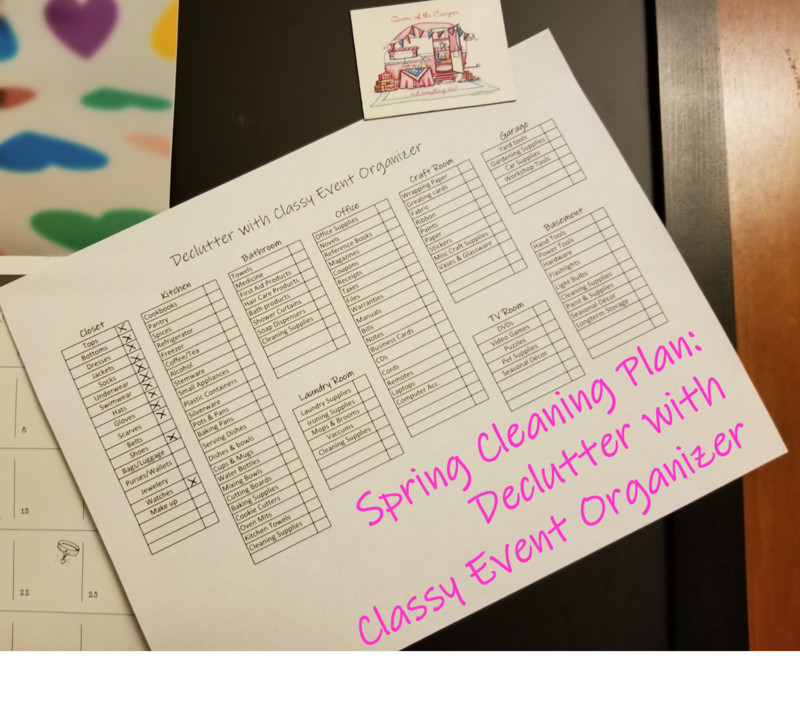 Along with the regular “cleaning” part of Spring Cleaning, I usually do my annual decluttering during this time as well. This year however, I decided to take a different approach. I’ve done the whole “15 minutes a day” cleaning, room by room cleaning, three boxes: keep, toss and trash approach, but still nothing really “sticks”. I always end up with the same items being dusted off and put right back to where they were hiding. I’ve bought organizing baskets, made my own containers, etc to store all the stuff I’m keeping, however my house has always felt cluttered, even after I’ve decluttered! Now I’m not a huge fan of the minimalist look, I like to see my stuff, and I like the memories they bring when I pass by a tray that holds my jewelry that my sister gave to me for my birthday, or the pink bowl holding bottle caps that my grandmother passed down to me. These items bring me joy, but sometimes that joy is over shadowed by the not so joyful feeling of clutter. I did listen to two audiobooks (thank you hoopla) in the last two months that I feel have significantly helped me deal with my clutter. (Side note, if you have never tried to listen to an audiobook, I suggest you try! While driving, while doing laundry, or washing the dishes. It like multi tasking to the max!) The first book I listened to was “The Life Changing Magic of Tidying up” by Marie Kondo (which I listened to before I even knew she had a show on Netflix). 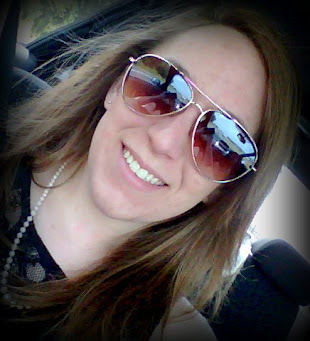 The second book was “Grace, Not Perfection” by Emily Ley, the owner of the Simplified Planner. Although these books are completely differently, one of the points that both of these books had regarding “decluttering” was to not feel guilty about getting rid of something. Thank it, and just LET IT GO! Now, for those of you who know Marie Kondo’s method (Konmari), in my opinion, the theory of picking each item up and asking yourself if it brings you joy seems a little corny. My friend and I joke about this anytime we pick anything up now. Even the handy dandy Husband will pick up my cat and ask if we can get rid of her because she doesn’t bring him joy (yes, so funny). But this theory of sparking joy is something that I think a lot of us are missing as we live amount our mountains of possessions. Emily Ley’s theory was to simplify life, only keep the best, the favorite and the necessary. Seems rather similar in theory and very simple. I decided to try a mix of the two “decluttering” methods from these books and see how I did. Both of these books were also similar in the fact that they both gave “permission” to let things go. Don’t feel guilty that you don’t use an item anymore. For example, I’ve had half of my closet full of beautiful dresses, skirts, suits, clothes, etc. that don’t fit because they are too small. Some of them I’ve had for 10 years or so. Each year I did my spring cleaning, I kept these items because “one day” I’ll fit back into them, or I felt guilty because they were rather expensive when I bought them. (Please tell me I’m not the only one with this problem!) These items no longer sparked joy. They sparked guilt and sadness that I was no longer that smaller size. When I gave myself permission to get rid of anything that didn’t spark “joy” or make my happy I was able to open up my closet and find clothes I had forgotten about. I kept two of my very favorite dresses that were still a bit small, but I just enjoy looking at them, the rest of them were I the “get rid of pile”. It is so freeing to be able to let go of these items and not feel guilt. The KonMari method is about going through your possession in category, not by room and I understand this theory as she explains it in her book, however I already know that I’m not going to store my novels with my cookbooks or vice versa. I like my cook books in the kitchen. And I like my novels stored in my library shelves. So, I decided to use the Emily Ley theory of going room by room and mix it up with the KonMari method of sorting category by category. This way will also keep my messes of pulling everything out blocked off to one room and not the whole house as this process can take several months. So here’s was my plan, and how I decided to organize myself. By using each “room” in my house as a first category, I made a list of what sub categories I store in that room. I decide to start this de-cluttering in a room that we call my “closet” room. It is a guest room that houses my clothes, shoes, hand bags, make up, etc. I thought this would be the best room to start as it wouldn’t disrupt normal everyday life and it was clothing was the first and seemed like easiest category in Mari Kondo’s book. I made a checklist (see below for printable) and started to go through all of my clothes. I first started with tops, so I pulled out all of my tops (folded/hanging, tshirts/sweaters, old/new, etc.) and placed them on my bed. I went through each item, picked it up and decided if it “sparked joy”. Some items were easy! However, some items were hard. I through those items into a pile to go through last. By the time I got to those last few items, I was prepared to make a final decision. I then continued through my list and parred down my clothes to about half (okay, maybe like 60%). I ended up with so much space left in my closet which I thought would make it feel barren and sad, but it actually felt freeing. After the first day of my decluttering, I tackled two “sub categories” and I could actually see what was in my closet the next morning. Trying to find an outfit was “easy”! WHAT?! And even more exciting, I found a pair of new sweatpants with the tags still on them that I totally forgot that I purchased months ago. I’m wearing them as I type this, and they are so soft and warm. The ease of getting ready in the morning was such a great feeling that I couldn’t wait to get back to my decluttering that evening. Also, I have now ingrained in my brain that I never want so many items in this space that I won’t over-buy, or keep items due to guilt again. After going through several “sub categories” I found myself with a very large pile, (about 4 trash bags) of clothes. I found an app called “Poshmark” where you can sell (and buy) almost anything, but the sales are usually geared towards brand name clothes and accessories. I decided to take a few pictures and see if I could sell these items. I had no idea what I was doing, but I posted a few items that were brand named and actually made some sales! I turned those clothes that were sparking negative joy into some moola! Poshmark is like having a garage sale 24/7, and you don’t have to try and make change for anyone or deal with those pesky neighbors who just want to see what you have to sell (please tell me you know what I’m talking about here). Never heard of Poshmark, but want to try it out? Just use my code “JSandlin10” to sign up and get $5 just for joining! For full disclosure, I’ll get $5 if you make a first purchase! I’m almost done with decluttering my closet room, and it feels fantastic! My next task will be the room I am usually in the most during the week which is my kitchen. I will tackle each category as I did before one at a time and viciously keep or get rid of each item. I am actually rather excited to see what comes out of that category! You might be wondering how you keep from creating this same decluttering issue in the future, well I have a solution, my friend. For example, each time I fold and put away my clothes, I take an extra second (it only takes one or two) to check over my clothes and ask myself if the item still “sparks joy”. This mental process each and every time I go through my laundry will keep me from having to spend days and weeks going through my closet and having to do an annual decluttering each year. To help me stay organized and on track I made my own checklist to put in my planner so I can cross off each item when it is complete. Oh the sweet, sweet, feeling of crossing something off a to do list. 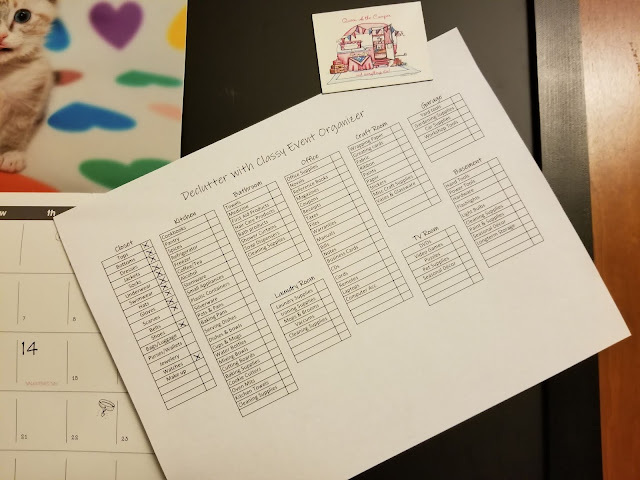 I wanted to share this checklist as a printable freebie to give you some inspiration to join me in this decluttering journey once and for all! 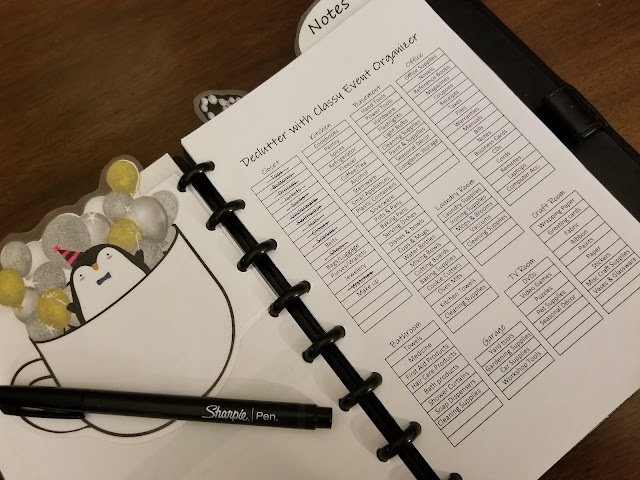 Check out my printable (full page of A5 planner size) and print it as is or as inspiration to create your own and share it on my Facebook page! I would love to see what you are using to declutter and spring clean this season! 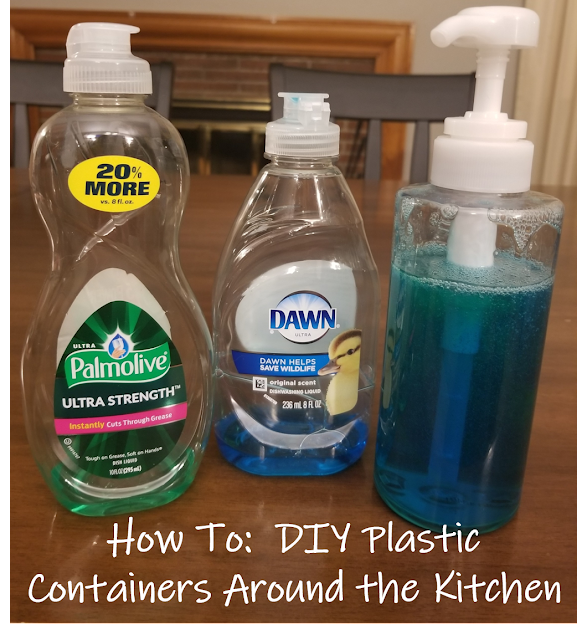 A few years ago I shared how I turned Starbucks Coffee Bottles into the popular faux milk bottles for parties, it was the perfect combination of making something similar to a product that I couldn’t afford, as well as recycling my trash! I also shared how I turned beer holders into a cute utensil container instead of buying a new one. I love using containers that I would otherwise throw out as something useful because I feel like I’m getting a bigger bang for my buck! 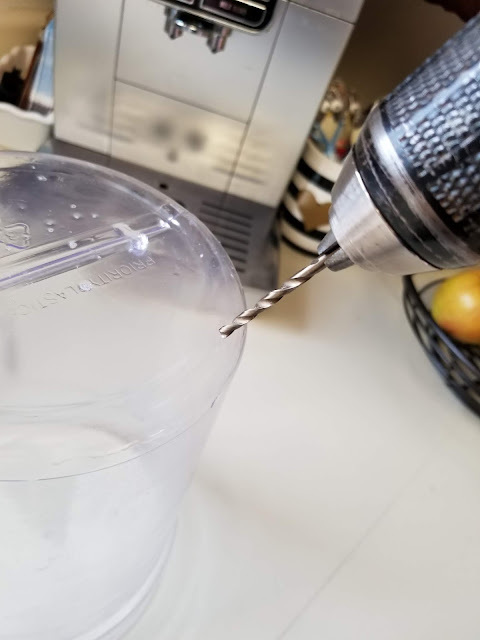 I ran into two different issues in my kitchen that needed a solution and I decided to use my “trash” that was sitting in my recycling bin to fix! The first issue I had was with the way I was storing my dish washing brushes, and I shared some of this project on my instagram (follow me here!). 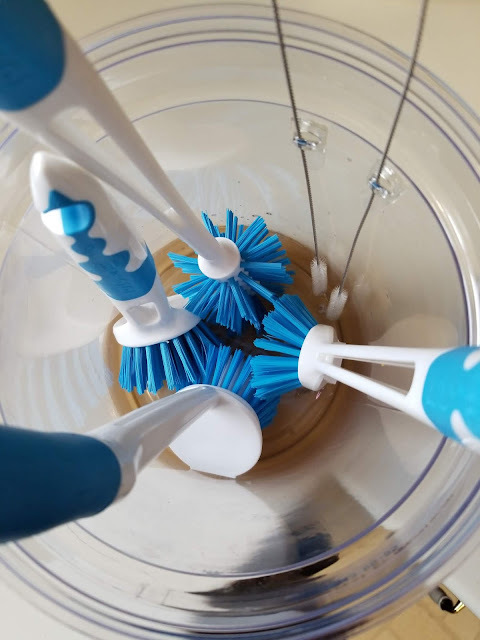 I love using the dish washing brushes from Aldi because they seem to get my dishes cleaner and are easier to use compared to sponges. They also last longer, but are harder to store. 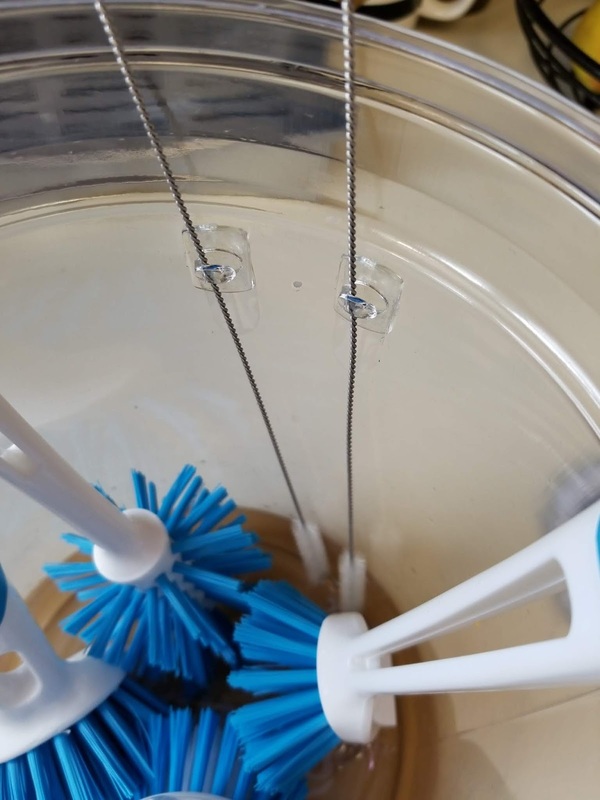 I also just purchased two straw brushes from Amazon to clean my plastic straws that I wanted to make sure didn’t get beat up in storage as they are a little bit flimsier than the Aldi brushes. My current storage container was a plastic cup, yes, a plastic cup. 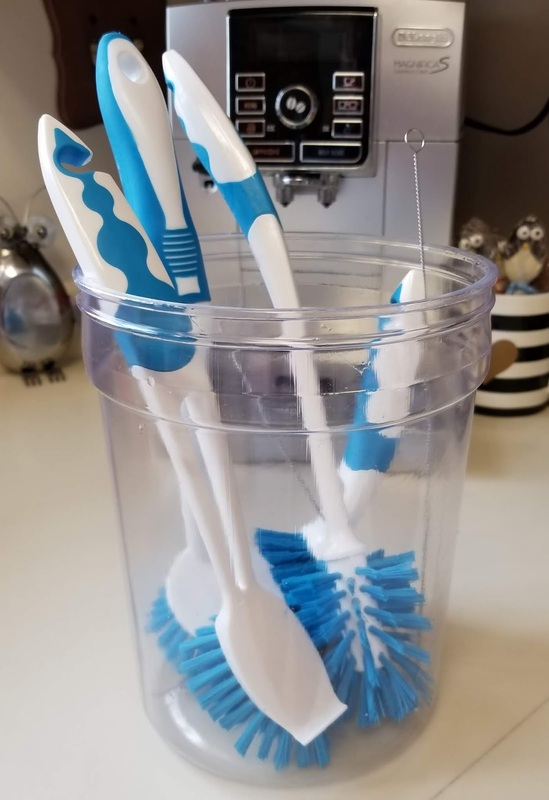 This worked for one or two brushes, but each time I went to grab one of them from under the sink, the whole thing fell over. Also, the times I could get it to balance and stay standing, I had to store the brushes handle down which made them hard to get out and put away after use. Since I store my brushes under the sink, I didn’t want to spend money on a caddy, the solution to my problem didn’t need to look “pretty”, it just needed to work. My goal was to get a container that was large enough to hold all the brushes handle side up and be able to drain, much like a plant pot. 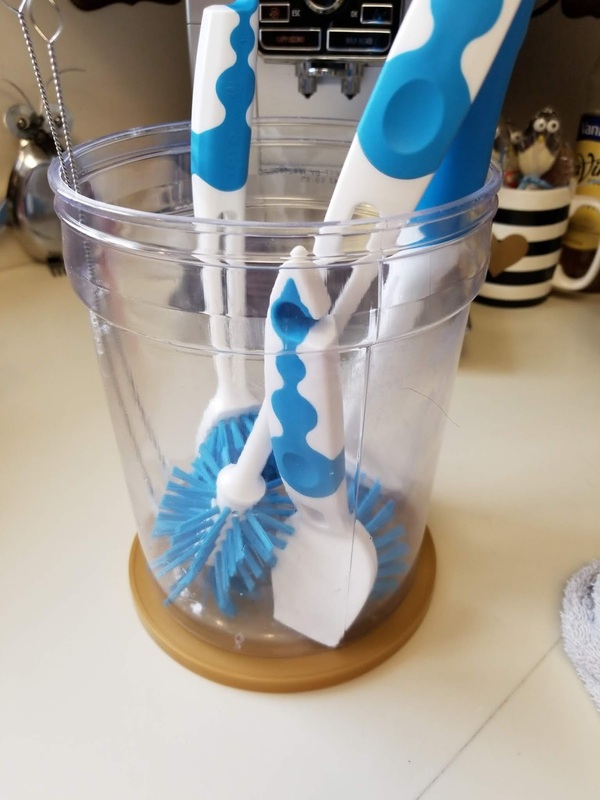 When I found an empty pretzel container in my pantry cabinet (yes, empty, but that’s another story), I thought to myself “Self, could I turn this into a bin for my dish washing brushes?” And then I thought, “Why not try it and if it doesn’t work out, I can just toss it in the recycling bin?” I decided to try it out by throwing my brushes in the container to see if they would fit, and they did! To turn this pretzel container into a brush holder, I first took off the label. I did this by using hot water, soap, and a magic eraser. By the time I was done scrubbing, you couldn’t even tell it ever had a label on it. It was just a clean clear bucket. Next, to make drain holes, I drilled some holes into the base. I used a ¾ inch bit and drilled holes in the base about an inch and a half apart. 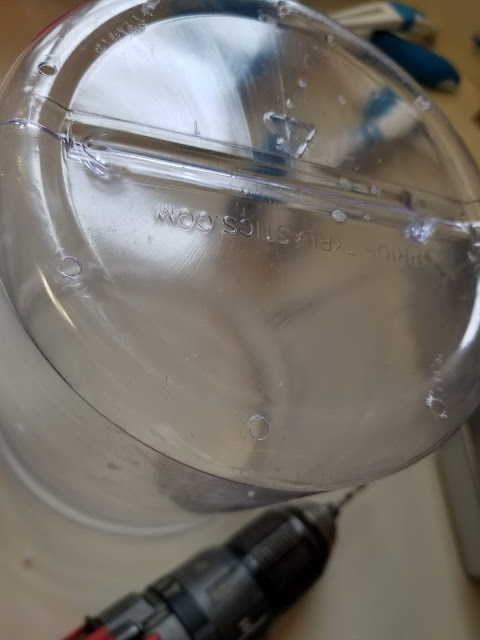 For a tray for water to collect under the container, I decided to try out the lid. It was either use the lid or a plastic plate, so I opted for the lid to see how it worked. Then, to keep my two new straw brushes safe, I added two command strip hooks to the inside of the bin to lock in the straw brushes. The brushes just happened to fit in the command strip hooks, so they stay put when in storage but are easy to pull out when needing to be used. 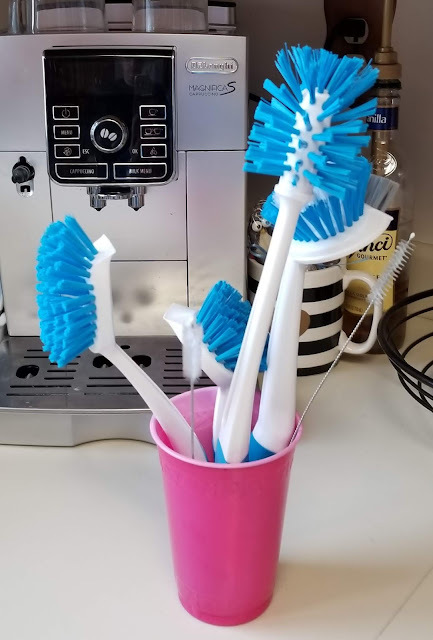 And there you go, an easy answer to my lack of dish washing brush storage! The second issue was with my dish soap container. I had a very cute dish soap dispenser that I bought from the Container Store several years ago, but it rusted through most of it’s parts and no longer worked. (it was a very sad day when I said good buy to this dispenser.) 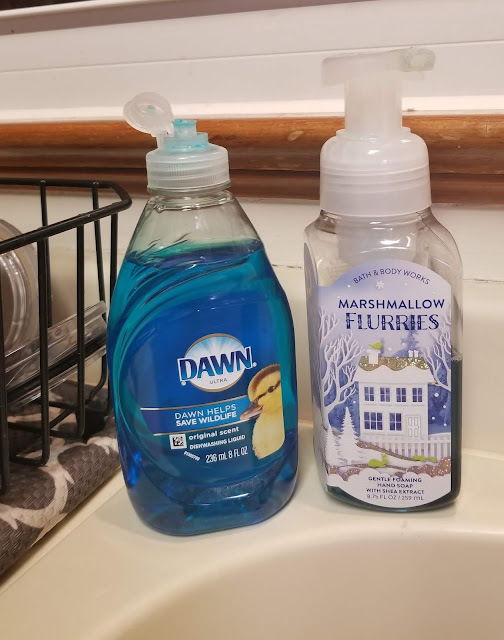 In the interim, I tried to use a spare olive oil bottle for a cute replacement, however it was glass (breakable) and was very slow to dispense any soap onto my dishes in the sink because I had to turn it upside down and wait for the soap to slooowly come out of the top of the bottle. It became more of a chore to use, and even though it was “pretty” on my counter, function wins over form what it comes to dish washing! So I was on the hunt for a new container for my dish soap. 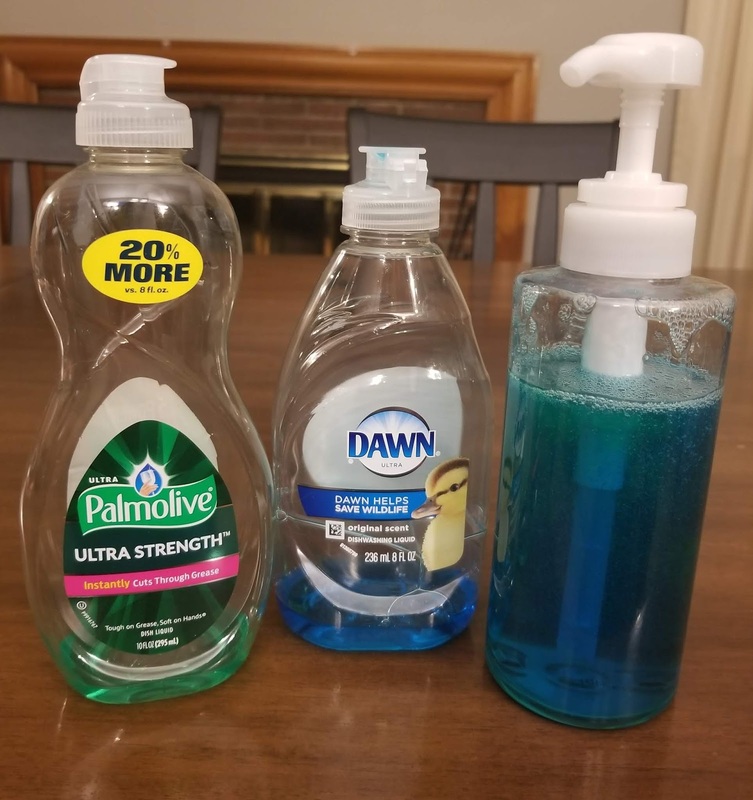 Could I just stuck with the Dawn or Palmolive soap container? Sure, but I wanted something cute because it sits out all the time! The solution to this issue started with washing my hair, yes, washing my hair. 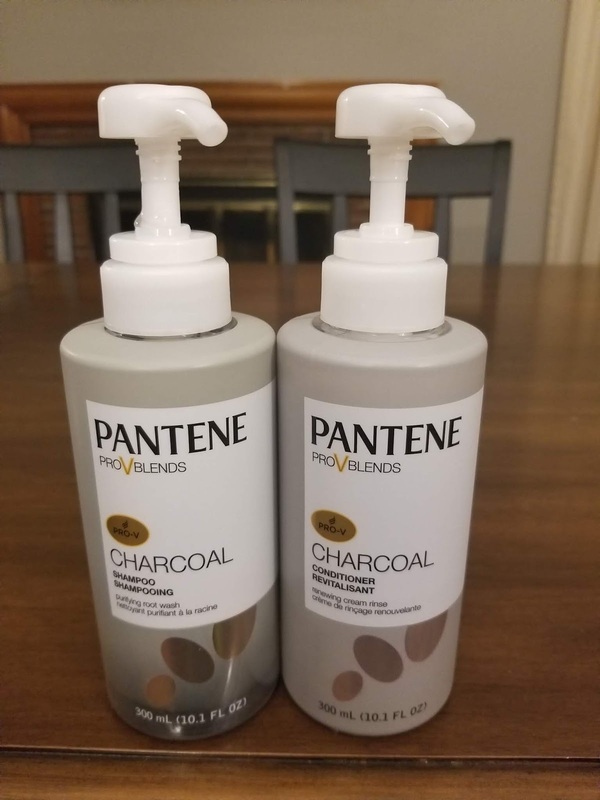 I started buying Pantene Charcoal Shampoo and Conditioner a month or so ago, which by the way is AMAZING and totally worth the price if you ask me! What is nice about reusing this type of container is that the bottle isn’t flimsy, but if I need to replace it, it won’t be as sad as tossing out a soap dispenser I purchased from the Container Store. I can just recycle the old one and use a newly finished bottle of shampoo. Easy Peasy! 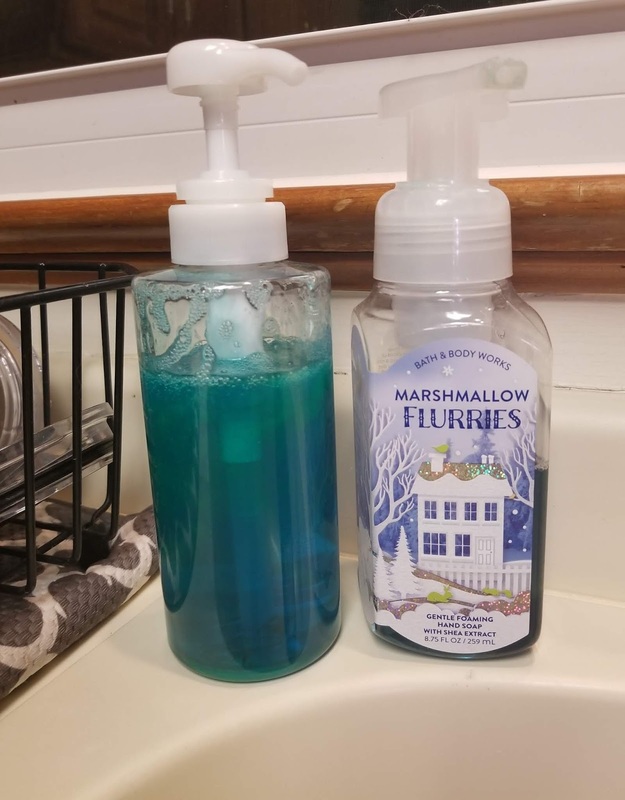 Now doesn’t that look so much better than a regular ol’ bottle of soap sitting on the counter?! How do you re-use containers around your house? Do you think about how to reuse a nice container before throwing it in the recycling container? About this time last year, I wrote a post with a few tips on how to care for an African Violet and how to encourage it to bloom. Since then, my plant has bloomed two more times! It has also grown significantly and has nearly outgrown its pot. As the plant grows taller, more and more of the stem becomes exposed making the plant top heavy. Not sure what to do, I visited my local garden center. While perusing the store, looking for good deals on house plants, I asked one of the kind employees what to do about my African Violet! She told me that in order to help an overgrown African Violet, all I needed to do was to repot it and the exposed stem would grow it’s own roots. I decided to document this process to share how to repot an overgrown African Violet, but also to try my hand at African Violet propagation. Let’s see what happens! To start, I cleared space to repot my plant. Due to the crazy low temperatures and rain, I had to do this project inside instead of outside! To contain any spilled dirt or water, I use a boot tray. I get mine really cheap from Aldi and they work perfect to keep my space clean while indoor “gardening”. I then took a look at my plant. Yes, I just LOOKED at it. One of the coolest things about an African Violet is that it grows uniformly in a circle, so I wanted to make sure that I kept that shape. Much of the stem was already exposed due to leaves falling off throughout the year, so I took note of which leaves I could take off and the plant would still look balanced. I didn’t want the plant to be lopsided! Next, I popped several of the leaves off. First, I removed the leaves that were yellowing. Then I popped off the green leaves that would balance out the plant since I just removed the yellowing ones. Then I popped a few off to make the plant the size I wanted it to be. In all, I popped off about 15 leaves. These will be used for propagation, so I took off a few more than I might have done otherwise. By “popping” off, I mean that I carefully wiggled the leaf at the base until it “popped” off from the step. If you try this method and the leave rips off, that’s okay. You can use it for propagation, and pop the rest of the stem off at the base. Next, I planted the main plant back into it’s pot with fresh soil. I made sure to clean the pot out completely to give it a fresh start. I have used the Espoma African Violet soil in the past, but I purchased the Miracle-Gro African Violet soil from my local garden center because it is what they had in inventory. My review of these soils is below. I first put some soil in the pot, placed my plant, and then filled in the rest of the pot with soil, fairly easy. I purchased a second African Violet on clearance while at the garden center this weekend, so I potted it up the exact same way. I have no idea what color the flowers will be, so I’m excited for this one to bloom. 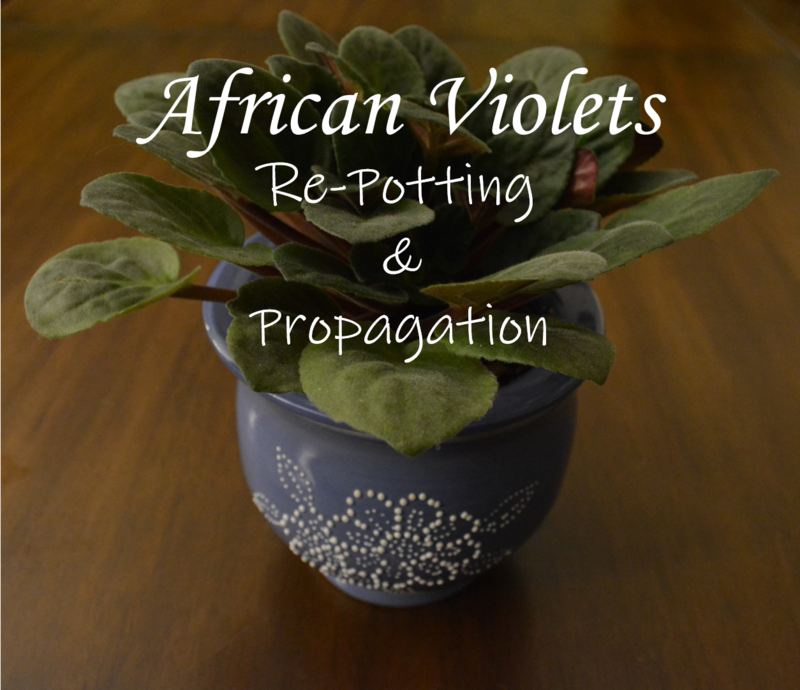 You can propagate African Violets from cuttings. This means, you can grow a second plant from a piece of the original plant, much like succulents. You don’t have to gather seeds and re-grow a plant like a pepper, for example. To propagate, take healthy looking leaves from an African Violet plant and take off the stems to about an inch from the leaf. Next, fill pots full of moist African Violet soil. Make sure the soil is moist and not completely dry! I used my watering can from Gardner's Supply to water my soil first. Then, place the leave stem into the soil at a 25 – 30 degree angle. The little hairs on the stem will turn into roots and a new plant will grow from that leaf. I put a tooth pick in one pot to mark that pot as having the “new” African Violet leaf, and not the my already known purple flowered plant. Any time I do an “experiment” I try to label and record as much as possible so I can learn what worked and what didn’t. I didn’t think that the two soils would be very different because they are both made for African Violets, but boy was I wrong. The Miracle Grow soil was more mulchy, while the Espoma soil is more loamy. I personally like working with the Espoma soil better. I also like that the Espoma has a zipper to close the bag, vs having to just fold it over – it is much more tidy! Currently, I’m noticing that the Miracle-Gro soil holds onto moisture a bit differently and my plants are reacting as if there is too much water in the pot. I re-potted and propagated using the Miracle Grow soil, but after a week I might report them again with the Espoma soil. I’ll give them all a week to settle into their new pots and see what happens. Most plants are fairly resilient, so they should bounce back in either case. Make sure to follow Classy Event Organizer on Instagram and Facebook for updates on these African Violets. Leave a comment if you have any African Violets and how you’ve repotted them or propagated them. I’d love to hear about your experiences!! I LOVE the mix of salty with sweet, specifically pretzels and chocolate. 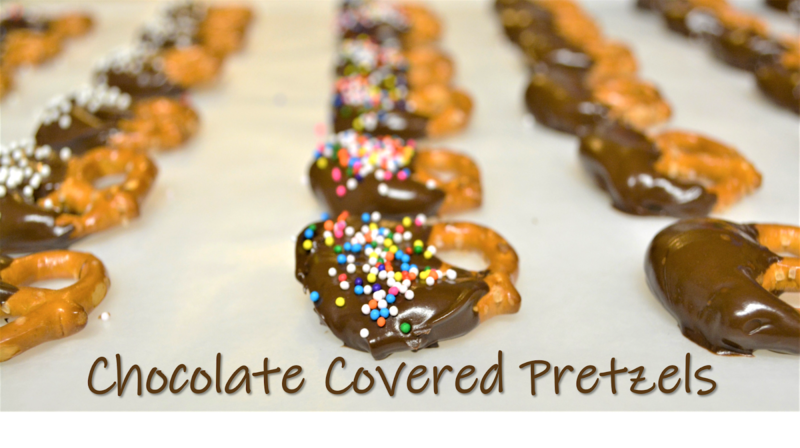 Chocolate covered pretzels are an easy fix for a salty/sweet craving! I have one issue with making chocolate covered pretzels, however, and it is that when I try to cover the ENTIRE pretzel, I get chocolate all over the place! (my hands, the counter, the floor, etc.) 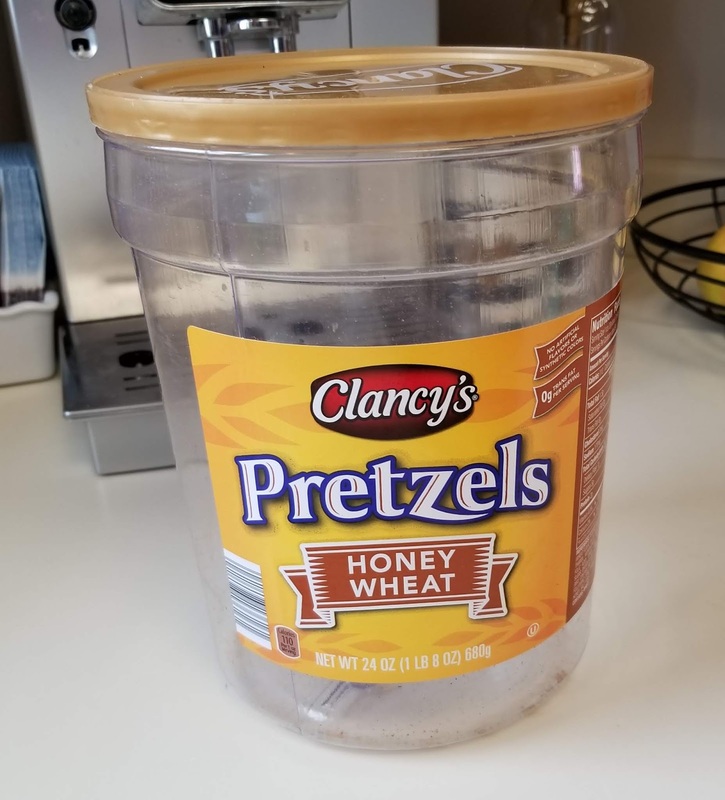 I have a new method that still gives me a bit of salt and sweet, while not creating a mess – only covering half the pretzel! 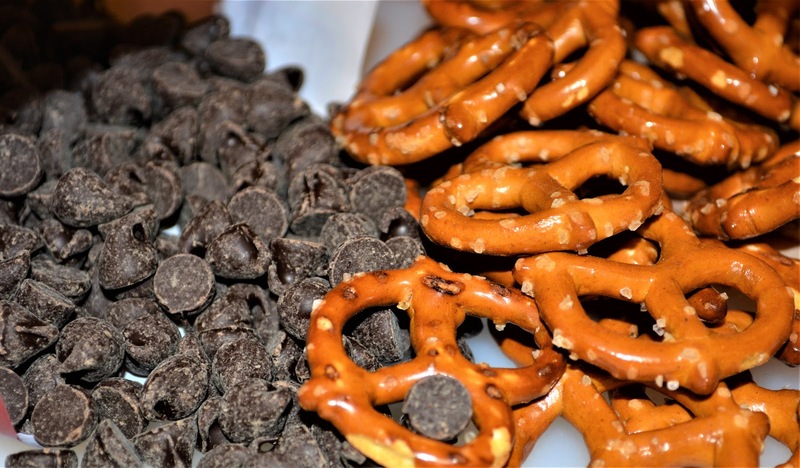 For this quick and easy DIY - you will need semi-sweet chocolate chips and pretzels. 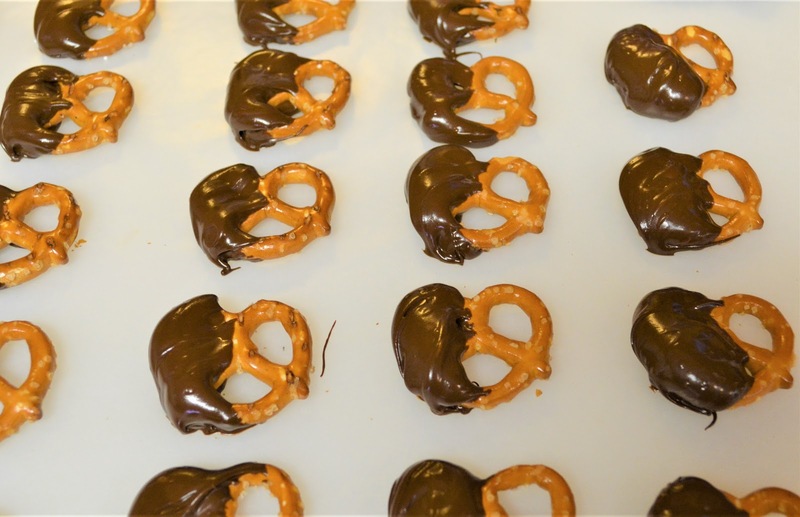 I use about 1 cup semi sweet chocolate for 40 pretzels – this doesn’t have to be exact. First, melt your chocolate chips. I always use my Crofton soup bowl from Aldi to melt my chocolate in the microwave. The bowl is microwave safe and has a nice handle so I don’t have to touch anything hot! It also has a wide opening that I can fit my hand in without getting covered in chocolate! 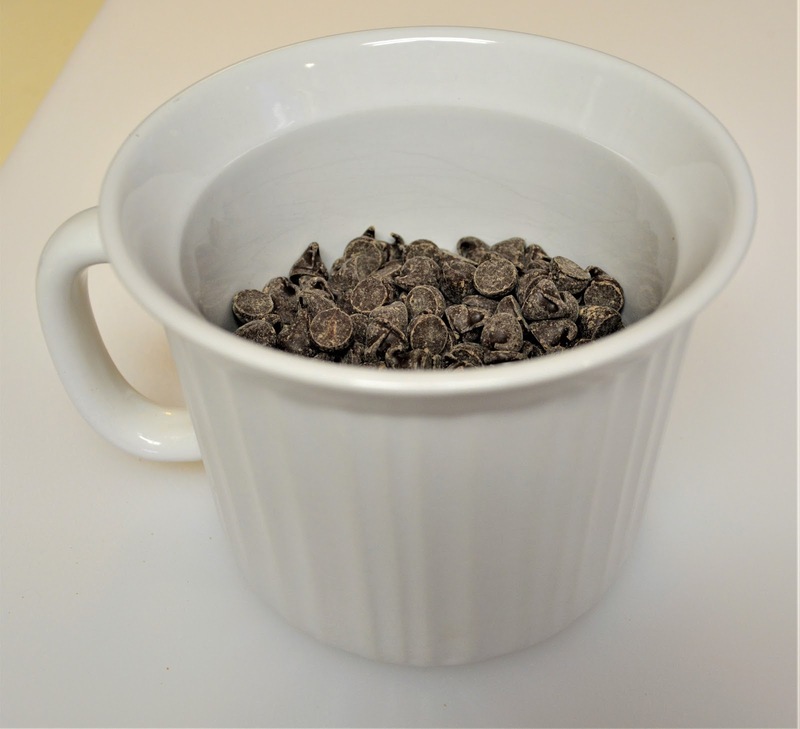 To melt chocolate chips in the microwave, put the bowl with chocolate chips in the microwave for intervals of 30 seconds. Between each interval stir the chocolate chips, making sure to move the ones on the bottom to the top so nothing burns. When you don’t have anymore lumps, your chocolate chips are melted! While the chocolate is melting in the microwave, cover your work space with wax paper for a place to lay your pretzels. This step makes clean up much easier! When the chocolate is melted, cover your pretzels by holding one side of the pretzel and dip the other side into the chocolate half way. Wipe any excess off the back of the pretzel on the side of the container. Lay the pretzel on the wax paper to set. Continue until you have used up all of your pretzels or all of your chocolate! Tada! Easy peasy – you made chocolate covered pretzels and didn’t make a mess! If you want, you can add sprinkles to your tasty treat to make them more festive! While the chocolate is still “soft” sprinkle your choice of sprinkles onto the chocolate for a bit of extra fun! 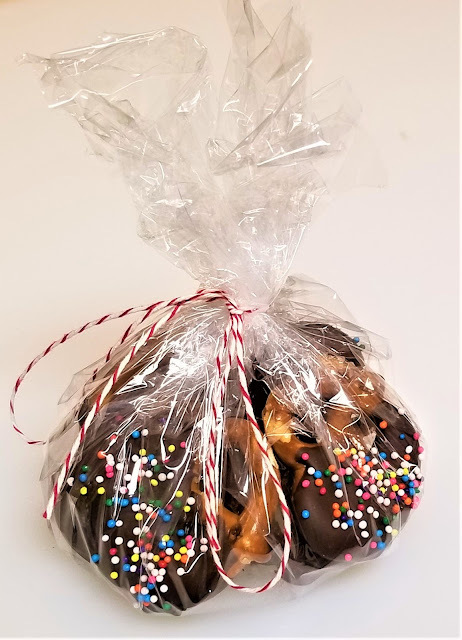 I made three different “kinds” of pretzels, some with white sprinkles, some with multi-colored sprinkles and some that were just plain chocolate covered pretzels. Now let your pretzels set until the chocolate is solid! You can store these in a plastic container, or make a small gift bag with plastic wrap and some baking twine or ribbon! These could be such a cute gift! I store mine in a plastic container in the fridge so the chocolate doesn’t become soft. 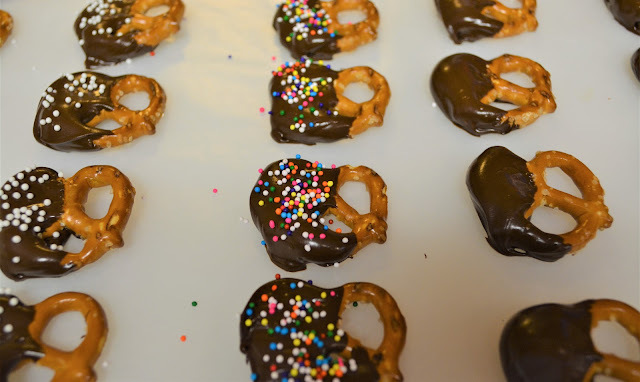 There you go, chocolate covered pretzels, in about 10 minutes and without any mess! For other quick and easy snacks, try out these chocolate covered Oreos or no-bake cookies! Leave a comment below of your favorite salty and sweet snack!